This album was not called volume 1, but started a new series. It is not clear whether a series was envisaged at the point of release. 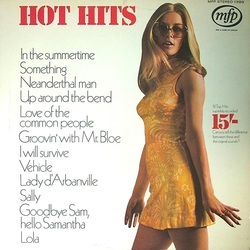 It contains two famous names: harmonica vituoso Larry Addler on "Groovin' With Mr Bloe"; and - supposedly - David Byron of Uriah Heep fame, vocalising on "Vehicle", although this has been disputed. The LP was recorded at Eden Studios. 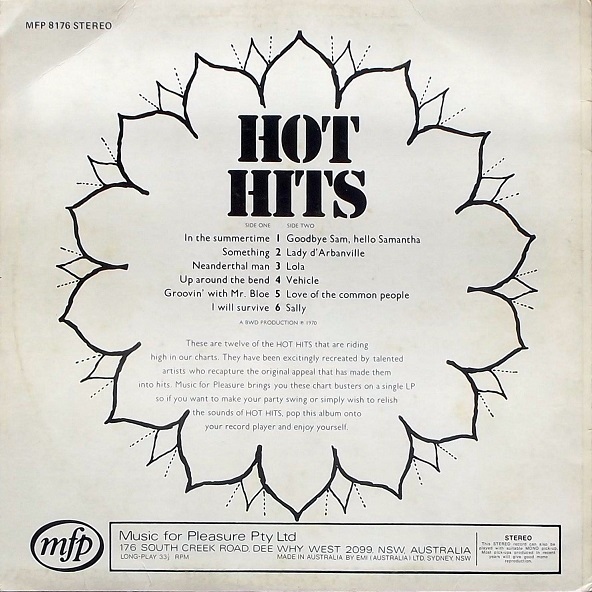 Shown above is an Australian edition of the album, also on MFP. It can be differentiated from the UK copy by the absence of a printed price, which on the UK edition is to the right of the model. The catalogue number is MFP 8176. 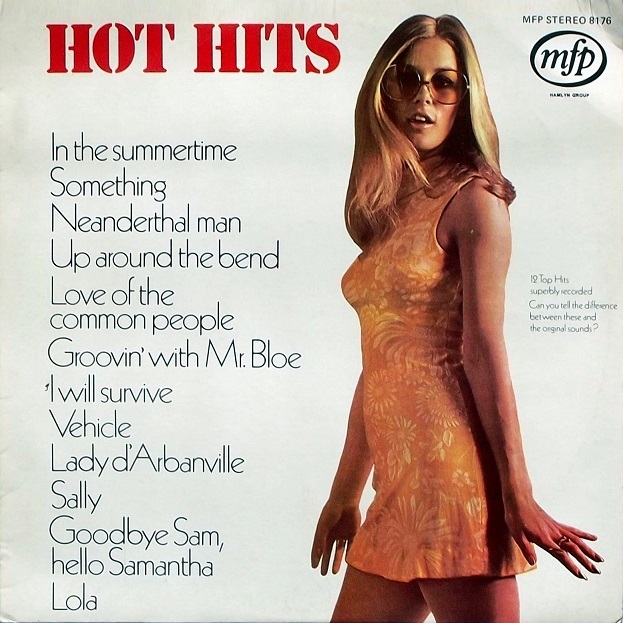 This compilation appears to have originated in the Netherlands, but was issued in other European countries as well. 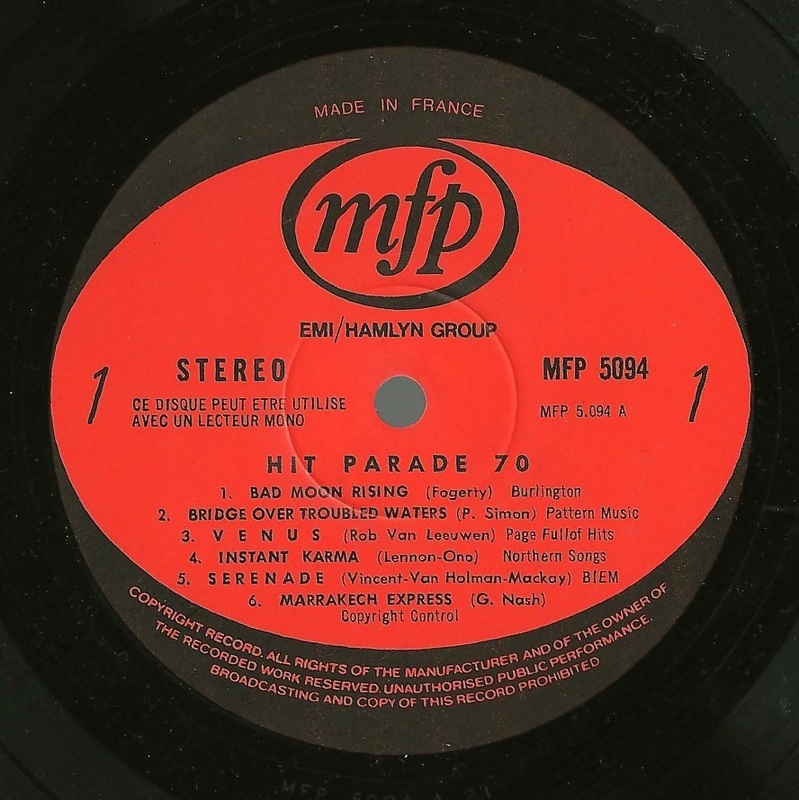 The sleeves appear to have all been made in the Netherlands, but as the labels above show, this pressing is French. The cover is of course based on that of Hot Hits volume 1, but none of the recordings are from the UK album. In fact, five of them are taken from earlier mfp Hits albums, and they are confirmed as being the same recordings. 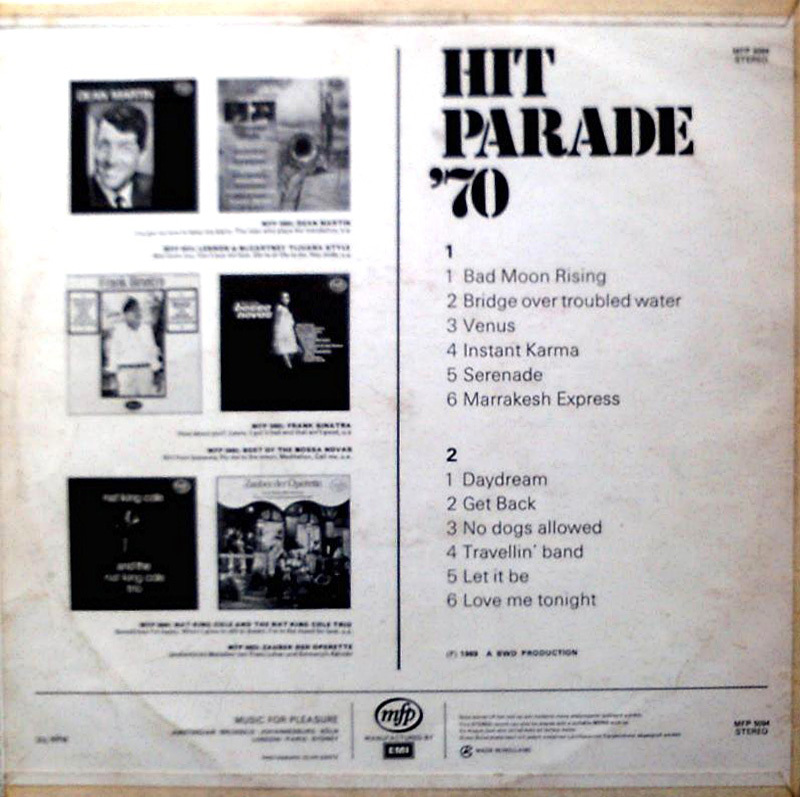 Two are from Top Hits of April 1969 ("Love Me Tonight" and "Get Back"), two are from Big Hits of August 1969 ("Bad Moon Rising" and "Marrakesh Express") and only one is from 1970: "Bridge Over Troubled Water" from Hits '70. 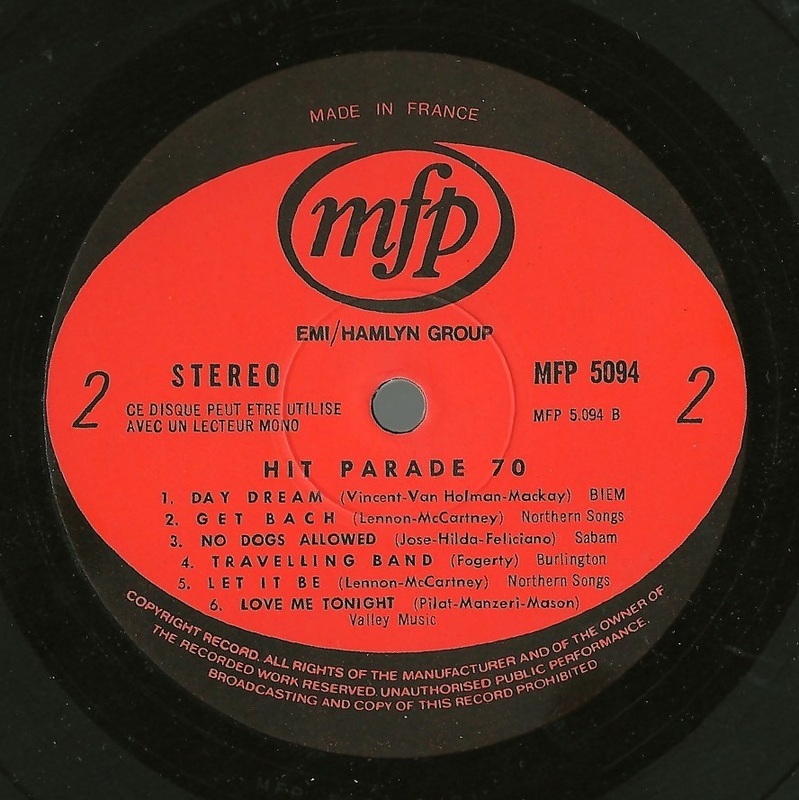 See below for other editions of the LP. 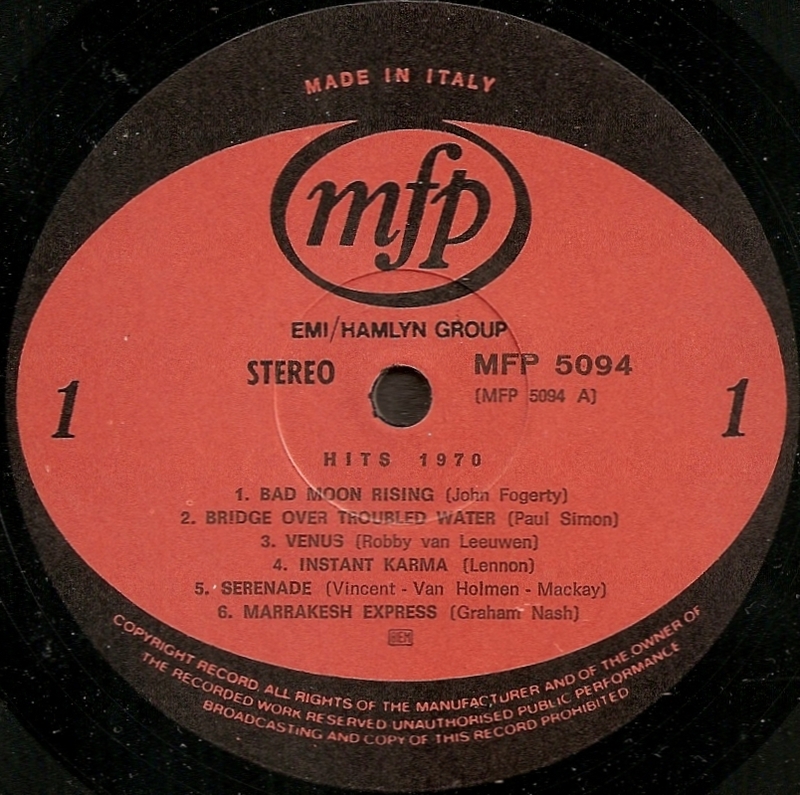 The record pictured left is the Italian edition of the Dutch LP, but with a small tweak on the title - Hits 1970 (at least, that is what it says on the label). This was also released in a Dutch-made sleeve. 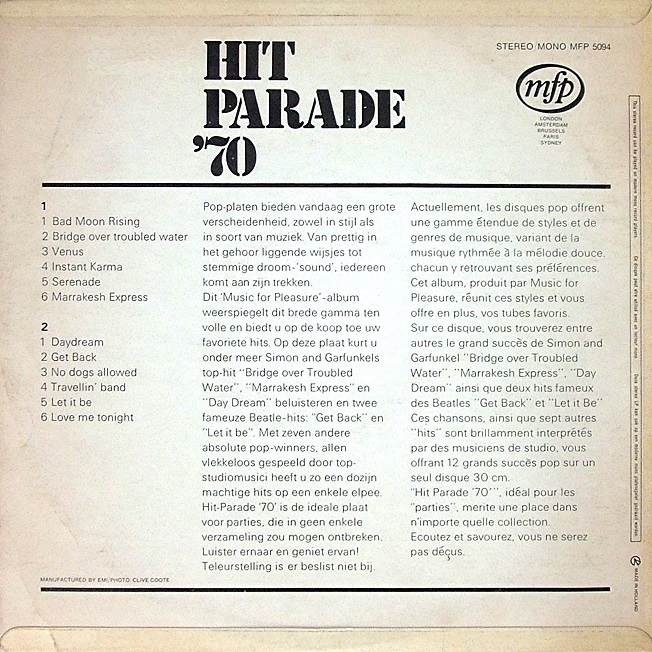 Shown above is either side of the Dutch edition of Hit Parade 70. It's credited to Bill Wellings on the back (as a BWD production). The design on the back of the sleeve differs from the other editions. 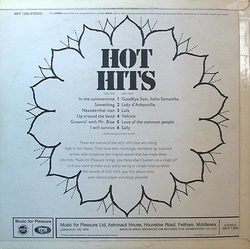 Although blurry, the tracks on this South African album can be identifited as the same tracks featured in the UK. The price given next to the model is in South African Rands: R 1.99.